Despite their long experience in global and domestic governance, policymakers from many nations struggle to find their way in Internet governance. On one hand, only governments can join international organizations such as the UN or WTO that directly or indirectly regulate the Internet. However, the same governments do not have a privileged role in other Internet governance bodies such as the Internet Governance Forum (IGF); the Internet Corporation for Assigned Names and Numbers (ICANN); or the Internet Engineering Task Force (IETF), where governments are one of many actors. Meanwhile, many other stakeholders are increasingly concerned about increased participation by governments in the technical infrastructure and governance bodies that underpin the Internet. In this event, we will examine several different governmental perspectives on Internet governance in these different venues. Dr. Susan Ariel Aaronson and Kyle Renner of IIEP and David Vyorst of ISOC-DC organized this event as part of an ongoing seminar series supported by an anonymous donor. 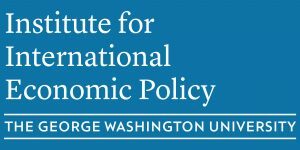 The Institute for International Economic Policy (IIEP), which is located within the Elliott School of International Affairs, GWU, serves as a catalyst for high quality, multi-disciplinary, and non-partisan research on policy issues surrounding economic globalization. The Institute’s research program helps develop effective policy options and academic analysis in a time of growing controversies about global economic integration. The institute’s work encompasses policy responses for those who face continued poverty and financial crises despite worldwide economic growth.